How do you avoid sharing TMI (Too Much Information)? At the same time, how do you avoid being too reserved or too closed with other people? One of the keys to effectiveness is to know and show yourself enough. If you know yourself well enough, you can share relevant information to improve communication and connect with others. One tool to help you with this is the Johari Window. 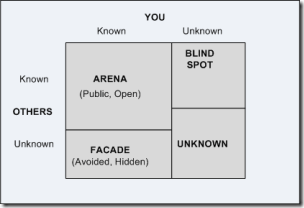 I first learned about the Johari Window in one of my leadership training sessions and it piqued my interest. It’s a simple model for interpersonal awareness. 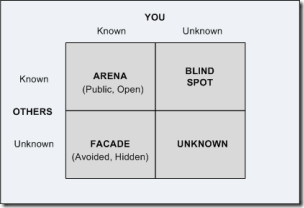 If you’ve ever struggled with TMI or self-disclosure, the Johari Window is your friend. 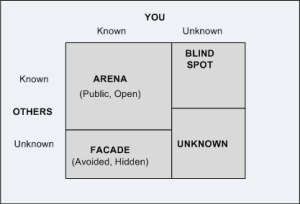 The Johari Window was originally created by Joseph Luft and Harry Ingham in 1955 as a tool to help people understand their interpersonal communication and relationships. 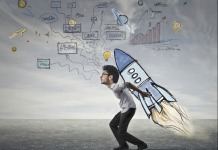 Open Self – What others know about you and you know too.. 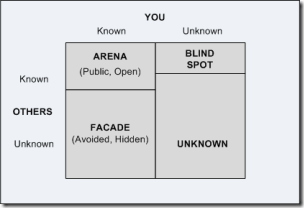 Blind Self – What others know about you, but you don’t. Hidden Self – What others don’t know about you, but you do. It’s your secrets. Unknown Self – What others don’t know about you and you don’t either. Showing people who you are requires self-awareness and self-disclosure. The Johari Window is effectively a lens on your own self-awareness as well as a lens on self-disclosure. 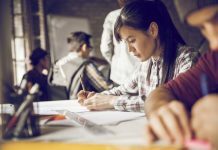 You can think of your self-awareness and self-disclosure as slider bars and the Johari Window can help you figure out where your slider bars are at. Understanding how you communicate with yourself and others. Understanding how you present yourself to yourself and others. Understanding how you perceive yourself and how others perceive you. The more you know about yourself and the more other people know about you, the more you can communicate on the same wavelength. By asking for feedback you can simultaneously reduce your Blind Spot while increasing the amount and quality of information you can share in the Arena. There hasn’t been a lot of exchange yet. Since others don’t know much about the new team member yet, the Blind Spot is small. On the flip side, the others don’t know much about the hidden or avoided issues, so the Facade area is large. There’s been a lot of exchange. Since others know more about the established team member, the Facade area is smaller. Also, since the established team member has received feedback, their Blind Spot is smaller. The subject is given a list of 55 adjectives and you pick 5 or 6 that they think describes their personality. Peers are given the same list and they each pick 5 or 6 adjectives they think describe the subject. You arrange the adjectives on the Johari Window based on awareness. Arena – Adjectives selective by participant and peers are placed in Arena. Facade – Adjectives selected by participant only are placed in Facade. 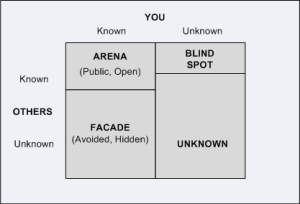 Blind Spot – Adjectives selected by peers only are placed in Blind Spot. Unknown – Adjectives not selected by anybody are placed in unknown. Next articleWho Are You and What Do You Want? This looks very interesting to use. I’ll see if I can give it a go somewhere… Even just with one colleague. JD, the exercise is interesting. I came across Johari Window while reading ‘Never Eat Alone’. It spoke about adjusting the way we communicate based on other persons personality/communication style. Love the diagrams. Visuals help me understand the point so much better, and these really work! I’ve found one of the most helpful pieces of self-knowledge is finding your blind spots. If your colleague can help you with just that, it’s a definite win. I haven’t read Never Eat Alone (yet), but it sounds interesting. I think adjusting our communication style is one of the most powerful, proactive things we can do. We can either want the other person to change, or we can change ourselves first and create a bridge. Thank you. I’m a fan of visuals, especially for sharing models. I do a lot of visuals at work so this was a good exercise. I want try the exercise during an outdoor session in late January. Thanks for stopping by. I hope this lens helps out. Interesting concept; I work in groups for facilitation. I will try to use it in them. the exercise is interesting. I came across Johari Window while reading ‘Never Eat Alone’. It spoke about adjusting the way we communicate based on other persons personality /communication style.